Mobile World Congress (MWC) is simply massive. As the global mobile industry’s largest gathering, the event saw some 108,000 people converge on Barcelona this week. It’s an opportunity for global brands to make some big announcements, and this year featured around 2,300 exhibitors. 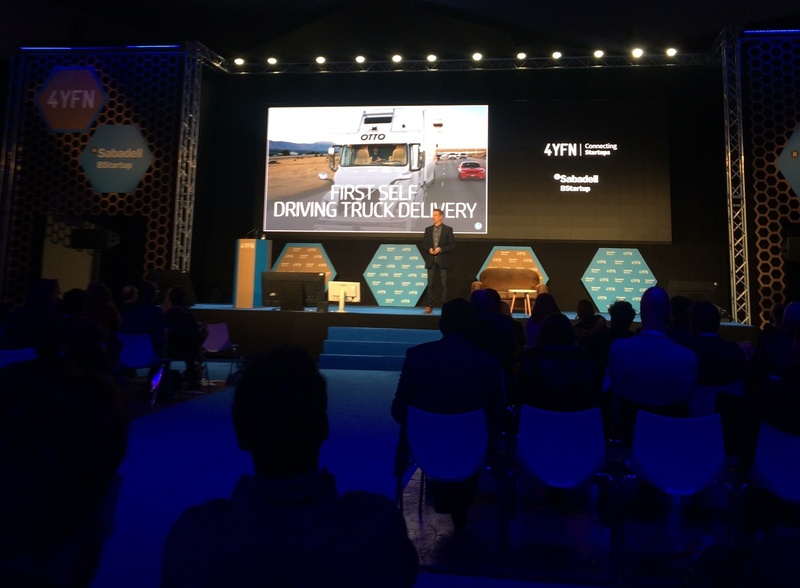 The conference also included hundreds of sessions, in a variety of different streams, discussing key themes like Artificial Intelligence, 5G and GDPR. With the exception of Huawei, every smartphone maker present at this year’s conference took the opportunity to launch a new device. The most talked-about of these announcements was undoubtedly Samsung’s unveiling of the S9 and S9+. Carrying the tagline “Do What Can’t Be Done”, Samsung’s successors to their S8 smartphones have been built for the social media era. With features including a once-again improved camera and speakers, as well as AR Emoji (to compete with Apple’s Animoji) and Super Slo-mo, the S9 and S9+ are designed to be the perfect companions for the social media devotee. Here’s a little more information and a full video of the announcement. The new phones are set to become available in the US around mid-March, with pre-orders beginning March 2. And, whilst not present at MWC, Apple had some rumoured information leaked this week about three new phones being released in the fall. One of the three is reported to be a new ‘mega-phablet’, which will featuring a 6.5 inch screen. Codenamed ‘D32’, the next iPhone could be one of the largest mainstream smartphones on the market. When it comes to social media on smartphones, bigger is better. Numerous studies have shown users of ‘Phablets’ (smartphones with a screen size over 5.5 inches diagonally) spend longer on average in apps and watch more video, for longer. Those activities are part of what social media is all about, and the proliferation of large smartphones is catering for a global population that is more engaged in social media and messaging apps than ever before. Whilst 5G was a major theme of last year’s MWC, the 2018 conference made it clear that 5G has moved from a long-term journey, to a real-life technology that’s just around the corner. 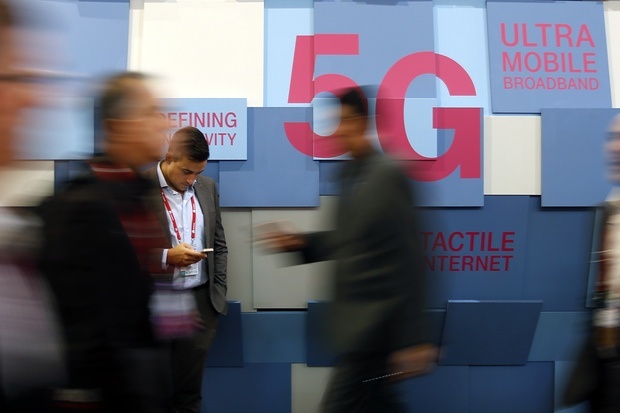 The ‘5G Summit’, at the heart of this year’s MWC, was proof of that and featured 2 full days of presentations from global telecommunications thought leaders. As the next generation cellular network, 5G will cause a significant leap forward in speed, compared to 4G. To give you an idea of just how much faster 5G is, it will provide the ability to download data at up to 2.3Gbps, compared to a maximum of 600Mbps for 4G. That’s a significant improvement but it’s not all 5G will bring. As well as increased speed, 5G will significantly improve latency. Latency is essentially the delay between the instruction to transfer data being sent and it actually happening. Obviously, high latency can cause significant frustration for users and a poor UX. Focussing on social, high latency is one of the things preventing AR and social VR from reaching their full potential. Right now, the issue with social VR and fostering ‘meaningful interaction’ through it, is that 4G simply doesn’t allow enough data to be sent between two humans, in order for them to share that kind of experience. 5G could be the key to unlocking mass adoption of VR, and the thing needed to drive forward Mark Zuckerberg’s dream of social VR. Analysts believe 5G could also allow advertisers and brands to make a whole host of new value-adding offers to customers, through technologies like AR. The ability for shoppers to virtually try on clothes, even outside of a WiFi connection, is just not optimal with 4G. 5G will make these experiences real and bring scale. For social media more broadly, 5G will only benefit the user experience. When the next generation cellular network arrives it will also serve to improve battery life, which means users will be able to ‘lose themselves’ in their instagram feeds for longer than ever before! 5G is not here yet, but in terms of time-frame, AT&T just announced that they will be rolling out 5G to 30 US cities by the end of 2018. In addition, Huawei launched the company’s first 5G chip at this year’s MWC, and Ericsson also made a similar announcement. Gum Gum, an artificial intelligence company with expertise in computer vision, presented on their technology’s ability to unlock the value of images on the web, social media and broadcast television. One of the most interesting applications of their technology is ‘sports sponsorship measurement’. Their AI-powered solution meaures exact screen time for each of a sponsor's brand placements during a football match, for example, and helps sports clubs quantify how much screen time sponsors are getting. This then allows the clubs to better negotiate sponsorship contracts based on concrete data relating to the actual screentime different placements receive. This session discussed the fact that AI is not a panacea for every problem we are facing today. The fact that we can imagine something doesn’t make it a reality, and AI algorithms can only be effective when fed good, clean data. Nuria also presented her views on the need for AI to develop ethically: “We really need to embed ethics into the technology we develop. We need to ensure these technologies are in line with the ethics we hold”, she noted during the session. This was a panel discussion, covering a range of topics, featuring Ben Levy (Bootstrap labs), Enric Quintero (Metriplica), Nuria Oliver (Vodafone) and Ulises Cortés (Barcelona Supercomputing Center). A very interesting point came from Ben Levy, who noted that AI will cause the death of the ‘as-a-service’ pricing model, in which companies pay on a per-user basis to consume a service. As AI potentially replaces headcount for many tasks in organisations, there will be a need for AI service providers to effectively measure and quantify the benefit they bring. Businesses will then pay for the ‘value’ they get from a service rather than the number of users interacting with it. There’s a whole lot of figuring out to be done on how that will work, but it was a very interesting point. With ad blockers almost ubiquitous today, does advertising still have a place? That was the theme of this session where Brian and Warren discussed the personal nature of mobile and how ads actually have to start delivering value in-and-of themselves. They also touched on the next generation of smartphone users, and how their experiences of brands are drastically different to even 5 years ago. Brian noted: “Think about a 14 year old with their first smartphone...their first experience of a brand might be through a chatbot, AR or VR experience. This is the new normal”. Joe talked about a number of things, and touched on AI and Machine Learning at one point. He noted that AI is something everyone is talking about today. For him, it’s like what the theme of Big Data was 5 years ago. He referred to the fact that AI has been present in advertising technology for some time, enabling advertisers to do things like optimize budget spend. What’s changing now, according to Joe, is the scope of the automation available in ad tech, thanks to AI. It's now possible to do things like automatically deliver an optimized creative to a specific user, based on a wealth of data about their preferences and behavioir. And that's just scratching the surface. 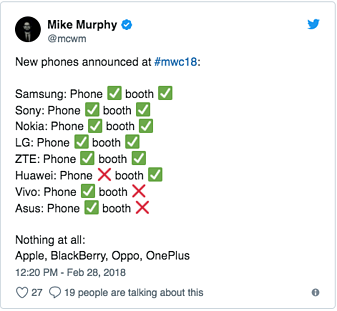 The looming deadline of 25 May seemed to hang over a lot of the discussion of different trends at this year’s MWC. There was no doubt from anyone that GDPR will cause a change in the way businesses and brands interact with people. A session from IBM Mobile discussed the need for cultural change within organisations, to see interactions and relationships with individuals in a different way. 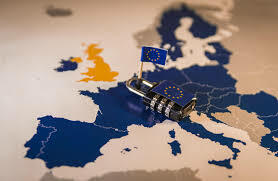 That session, which took place on Monday called ‘Client Data Privacy, Security and GDPR’, also identified some opportunities GDPR could bring to businesses including Reinforcing trust with customers and creating better digital engagement and personalization. The session also noted that, according to Forrester, only 30% of organisations are fully GDPR compliant as of today. Another take on GDPR came in the session mentioned earlier, around Advertising in the Age of the Adblocker. In that session, Brian Wong of Kiip mentioned that the GDPR was a result of consumers feeling like brands are using their data without their permission. He noted that ‘declared data’ can lead to much better experiences for users and relationships between them and brands. Those were just some of our highlights from this year’s edition of the Mobile World Congress in Barcelona. Don’t worry - there’s more analysis of the event to come, as we’ll soon be publishing two more blog posts in our MWC wrap-up series, where we will dive into the themes of 5G and AI in a little more detail! Subscribe to our blog to receive those next articles, as well as other posts on key trends and updates, right to your email inbox.